If you think death, longing, heartbreak and coming to terms with one’s own mortality sound like bad things, think again. All of these subjects are explored with great depth on Nashville singer-songwriter Levi Massie’s superb new album Sunrises & Cigarettes. Although this description may sound bleak, Massie manages quite successfully to underscore these issues with a surprising amount of hope and optimism. Hailing from Springfield, Ohio, the guitar-playing vocalist must have been born an old soul in order to be capable of writing such dark and introspective lyrics found in the 10 tracks offered here. Throwing his hat into the acoustic/folk/country genre, Massie brings to mind a modern-day John Prine and Kris Kristofferson with a little of Bob Dylan’s influence thrown in for good measure. These songs, which were recorded in Nashville, are presented in a stark, bare-bones, acoustic setting, which allows listeners to feel as if they are eavesdropping on private conversations. While legendary Country Music Hall of Fame member Charlie McCoy’s excellent harmonica work is featured prominently throughout the set, Massie’s haunting lyrics command center stage during the album’s entirety. A perfect example of this is the accordion-soaked, “In My Time, Dear,” which is pure poetry set to music. “So if you should wonder when love may come your way/remember true all the places you’ve been,” Massie sings eloquently. Also noteworthy is “Smooth Sailing,” which is a heart wrenching, yet affectionate tribute to Massie’s grandfather that tells the tale of the naval sailor’s death. “I never saw that man/no not once/ever back down from a storm/and I heard when he thought the ship was going down/he said don’t worry boys I’ve got it/it’s smooth sailing now,” Massie caringly reminisces. The title track “Sunrises and Cigarettes” closes out the album with such heartfelt and profound lyrics as “we all want more/but more or less/we settle for our second best/sunrise again over me.” This song provides a fitting end to this collection, and sounds as if a beautiful painting has been appropriately captured in words and music. Peter Young’s organic production style perfectly enhances the material without overshadowing Massie’s masterful lyrics. 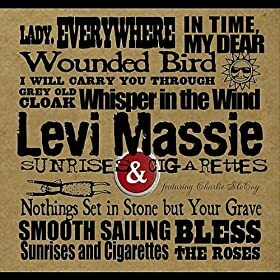 For those who are in need of a refreshingly honest, laid back musical fix, Levi Massie’s somber, yet reeling Sunrises & Cigarettes may be just the thing your ears have been anxiously awaiting. This is great songwriting in its purest form.